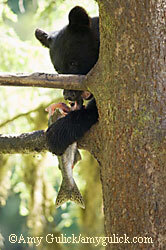 Bears often drag salmon into the woods and eat only parts of the fish, making the rest available to other animals and to plants, which benefit significantly from the nutrients. Amy Gulick photo. Albert Einstein once said, “If you judge a fish by its ability to climb a tree, it will live its whole life believing that it is stupid.” This article isn’t about the self esteem of fish, but how salmon, or at least parts of them, actually do “climb” trees. As research continues to show, trees depend on salmon, and salmon depend on trees. And in the process, countless plants and animals benefit from the incredible nutrient exchange inherent in every part of the process. Salmon are anadromous – they start their lives in freshwater lakes, streams and rivers, then migrate to saltwater where they spend, according to species, from two to seven years at sea before returning to freshwater to spawn. Why go to sea? Freshwater lakes, streams and rivers are nutrient poor. To grow big, salmon need the abundance of food the sea provides. When they return to spawn, salmon become a veritable conveyor belt for nutrients. 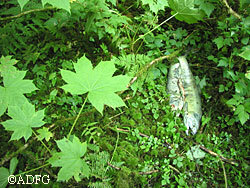 For example, an adult chum salmon returning to spawn contains an average of 130 grams of nitrogen, 20 grams of phosphorus and more than 20,000 kilojoules of energy in the form of protein and fat; a 250-meter reach of salmon stream in southeast Alaska receives more than 80 kilograms of nitrogen and 11 kilograms of phosphorous in the form of chum salmon tissue in just over one month. As the bodies of spawning salmon break down, nitrogen, phosphorus and other nutrients become available to streamside vegetation. According to Robert Naiman of the University of Washington, streamside vegetation gets just under 25 percent of its nitrogen from salmon. Other researchers report up to 70 percent of the nitrogen found in riparian zone foliage comes from salmon. One study concludes that trees on the banks of salmon-stocked rivers grow more than three times faster than their counterparts along salmon-free rivers and, growing side by side with salmon, Sitka spruce take 86 years, rather the usual 300 years, to reach 50 cm thick. An adult chum salmon returning to spawn contains an average of 130 grams of nitrogen, 20 grams of phosphorus and more than 20,000 kj of energy in the form of protein and fat. Scientists have long known that nitrogen content in a tree can be measured from its growth rings, and several research projects explore the link between nitrogen, tree rings and the size of past salmon runs. Using an increment borer, researchers extract small pencil-shaped samples of wood from the cores of ancient trees. The cross section of growth rings in core samples is then measured to determine nitrogen content. Sources of soluble nitrogen, as are found in sap residues, are removed to ensure an accurate determination of marine-derived nitrogen at the time of ring formation. Using a combination of streams with mature trees and years of known salmon escapement – the number of salmon that return to spawn – scientists found historical fluctuations in nitrogen levels taken from the yearly growth rings of trees show a positive correlation with the known number of salmon returning to spawn the previous year. Using tree rings to reconstruct historic salmon returns for the many watersheds where mature streamside trees still exist but escapement records do not, may become a valuable tool. And as salmon runs around the world fluctuate or disappear, ancient trees may help us unlock secrets of the past to manage fisheries for the future. But let’s get back to the present! Visit a stream at spawning time and you’re sure to see bears, wolves, eagles, ravens, crows and gulls, river otter and mink fishing for nutrient rich salmon. Bears often drag their catch onto stream banks or into forest edges to eat, and once they consume the oily roe, belly, brain and skin, the rest of the carcass is left untouched and available to other animals, like insects and small mammals. As leaching by rain and microbial activity break down carcasses even further, nutrients become available to plants in the riparian zone. 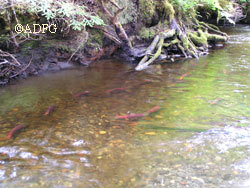 Sockeye salmon returning to spawn. When they return, salmon become a veritable conveyor belt for nutrients. And just as trees need salmon, salmon depend on trees. Every part of a tree participates in enriching a stream for aquatic life, from its tiny needles to its strong twisted roots. Streamside vegetation shades spawning streams, keeping developing eggs cool. The leaves and needles of streamside plants house terrestrial invertebrates which fall into the water and feed growing young salmon. In fact, the falling leaves themselves provide food and shelter necessary for aquatic insect populations, which also feed next year’s young salmon. Tree roots stabilize stream banks to slow erosion and protect the clean water salmon need to survive. Fallen trees create pools that shelter young fish and provide a place to rest away from strong currents. Fallen trees also direct stream flow, store and distribute sediment and create riffles and waterfalls. The organic matter trapped by woody debris provides food and housing for aquatic insects. Working as a fisheries technician for the U.S. Forest Service, I spent one summer tossing root wads and tree limbs into streams that were once cleared because the debris was thought to impair fish migration. Now we know better. So next time you enjoy a good salmon dinner, thank a tree. If you are lucky enough to encounter an ancient monarch like a huge Sitka spruce while hiking along an emerald stream bank, thank a fish as well! Anne Post is a biologist with Fish and Game in Douglas, Alaska.